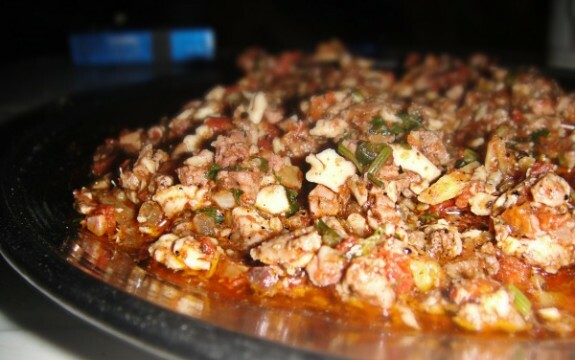 Kata-Kat or sometimes called Taka-Tak is a very popular dish originally from Karachi, Sindh but very common throughout Punjab province, you will see it being cooked on large size tawah on the food streets across Lahore. Its a great way to benefit from the nutrients of mutton brain, kidneys and liver. On a tawa put some water, add kidneys and mutton chops, keep chopping constantly until small pieces are made with a help of katakat meat cleaver. Add garlic water with finely chopped onion and tomatoes, ginger slices and green chilies, add salt, chili powder and brain, again sprinkle with garlic water and keep doing katatkat with 2 special spoon. Add coriander leaves, ghee and yogurt, cook well, lastly sprinkle katakat masala, kasori methi, coriander leaves, keep shredding/katatkat with help of a cleaver. When everything is cooked and ghee comes on top, serve with nan.